On a rainy day, Mum and I used to have a colouring-in competition. While she never let me chose the walls as my canvas, she would always go for my Duck Tales book (which made it mostly hers), while I picked books with a bit more mettle, like Transformers. Well, leave it to deviantartist Tim Wollweber to combine the two. 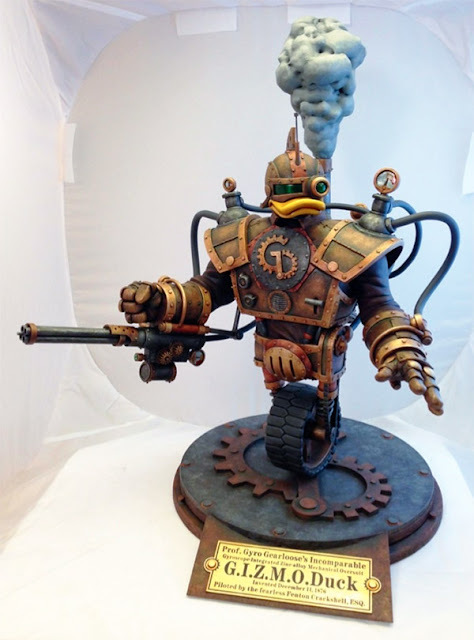 Folks, meet the steampunk Gizmo McDuck. Don't tell me, you still have the Duck Tales theme tune playing in your head don't you? WhooHoo! So... now it's stopped what do you think? I think that's pretty BA. And makes much more sense than a lot of steampunk stuff you see out there. I can truly imagine them putting this one together. And hearing the word "gyroscope" plausibly bounced around the lab. I see someone was reading my 80's week posts, and then said "yeah, that'll work." Duck Tales fans crop up in the best places. I agree - this is a pretty natural look for the duck. Who knows if the other Ducks can get steam plunked!